Pizza, carousel rides, and time in the play area at the mall!! Definitely her favorite party to date. She loved EVERYTHING about it! 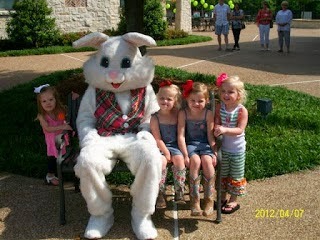 We had an egg hunt AND the Easter bunny came! You can see the decor here. We all sported our plaid and homemade bbq sauce was the party favor! Think LOTS and LOTS of candy!!! I think it is SO much fun planning kiddos' parties!! (Especially now that they get equally as excited!) But...I'm also SO glad when it's over!! haha! How is it the beginning of May and my kiddos are ALREADY talking about their parties next year? haha!! I loved all of your kids' parties!! I'm not sure I could even pick a favorite because I love them all so much! I laughed out loud about Nixon's dog park party...that was a fabulous compromise :). I love planning parties! Especially for Xavier! We did a Winter "One"derland theme for his 1st birthday. This last year we were going to do a transportation theme, but we had to cancel last minute since he was sick :( I still have everything so he might get that for turning 3! ha ha! Love the Lumber jack and jill idea! So cute! I found your blog from mix and match mama....she is my fav...but you are a close second....your family is so cute! !